The blog connects PhD candidates, early career and advanced researchers in European history across borders. For this purpose it shares information on research projects, relevant publications, and scholarly events. By debating scholarly and contemporary issues it addresses scholars also as members of the European polity and is reaching out to the general public by providing historical context to modern controversies, bridging the past with the present. The aim is to advance historical knowledge and inform debates on Europe from a historical perspective. Europe Across Borders is a blog by research fellows in the department of history at the Leibniz Institute of European History (IEG) at Mainz, Germany. The IEG comprises of one of the most active group of historians currently working on Europe from the early modern period to the twentieth century in Germany. It brings together the strong research expertise of early career and advanced historians. Our blog offers dynamic and innovative explorations of European history, and we warmly welcome guest submissions that will widen the blog’s horizon. 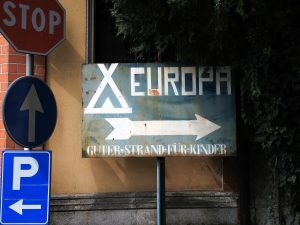 The blog is connected to the annual workshop European History Across Boundaries which takes place at Mainz for international PhD students who research European history from the sixteenth to the twentieth century, including Europe’s relations with the world. The workshop brings together young researchers working in this field to present their dissertation projects and to discuss the transcultural and transnational scope of their findings in a stimulating environment. The blog is also linked to the open access journal European History Yearbook, ed. by Johannes Paulmann (Mainz) together with Markus Friedrich (Hamburg) and Nicholas Stargardt (Oxford). You can take part in the discussion by following us on Twitter. This entry was posted in Actualités / News, Networks and tagged Europe, Global History, International History, Johannes Paulmann by Fabian Klose. Bookmark the permalink.